Over the next four years, Sputnik is set to enter the top 10 resources in the Russian network segment. At last week’s St. Petersburg International Economic Forum, the Russian National Telecommunications Company Rostelecom (in which the Russian government has a greater than 50 percent stake via Rosimushchestvo and Vneshekonombank) presented the beta-version of their latest development, the Sputnik search engine. At the moment, it is not possible to access this portal from abroad. Aleksey Basov Vice-President of Rostelecom told Vedomosti that Sputnik will help ordinary Russian access the developing state digital infrastructure. In Russia, the primary market for Sputnik, it will have to compete with Yandex and Google, which control 90 percent of the search engine market. However as Sputnik.ru representative Dmitriy Chistov explained to RBK the company is not expecting the search engine to compete directly with other market players. This is an entirely different concept. Aside from the search function itself, several other socially orientated services can be accessed through the portal. These can assist Russian citizens to access official information and state services, or to locate the nearest government agencies: the district health centre, police station and so on. This high-speed access to services is also displayed in the form of a widget in the search results. Rostelecom is hoping to see Sputnik reach the top ten resources on RuNet in terms of audience figures in just four years, Basov noted. Shareholders in Rostelecom are also expecting the project to become financially self-sufficient in a short period of time. According to Basov the search engine will earn money via advertising and by taking a commission for providing certain services. The project will only begin to work commercially however after it leaves the beta-version behind. Rostelecom feels that an initial absence of advertising should also give rise to more active audience growth. The level of investment in the project has not been disclosed, however a Vedomosti source in Rostelecom previously estimated this to be $20 million. The Sputnik site states that this project began in 2008 as a start up by a team of enthusiasts passionate about searching for information. Rostelecom invested in this project in 2012. 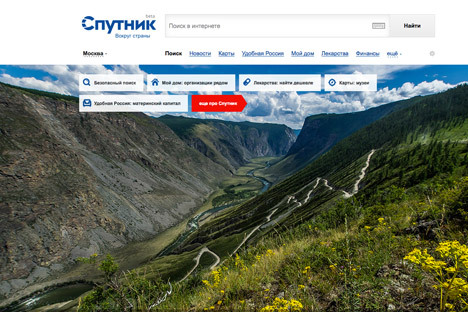 Ilya Ponomaryev, a Deputy in the State Duma had previously said in comments he made to RBK that the creation of a state owned search engine was discussed in the Kremlin, following the armed conflict with Georgia in 2008. According to him, the then-President Dmitri Medvedev’s administration looked initially at how media information is arranged in search data and how this influences public opinion. Basov responded to the question put by Vedomosti as to whether Sputnik would use administrative resources and would be installed in government agencies and schools, by saying that the project has market objectives and ways to meet them. He added that initially Sputnik’s primary resource would be investment as well as Rostelecom’s potential as both an infrastructure company and a national telecoms provider. Roem.ru confirmed that at the moment Sputnik.ru is not being made available to users abroad to protect it from DDoS attacks. Since the primary resources for botnet (the computers from which attacks are launched) are located abroad, isolating all overseas users (which are not the project’s target audience anyway) has solved this problem. In the future Sputnik.ru will be available to users from any corner of the globe. Based on information on ‘Vedomosti’, RBK, Forbes, Roem.ru.